1. Why were there two babies at Sabrina’s birth? This is a question left hanging over from season 1, and guess what: It still hasn’t been answered. We now know that one of Sabrina’s dads was Satan himself after he helped Diane and Edward have a child, but that doesn’t help us get to the bottom of this particular question. During flashbacks in seasons one and two, the altar in the woods where Sabrina was born had two left babies on it: One with goat feet and another with human feet. Does one represent Sabrina's witch half, the other her mortal half? Or does Sabrina have a half-angel twin everyone is staying quiet about (Lucifer Morningstar was involved in her conception and is an angel, after all)? Will Lilith find this twin in Hell in season 3? Give us answers, damnit! 2. Why are the Weird Sisters so special? The Weird Sisters display some incredibly impressive powers that appear to go way beyond the abilities of ordinary witches: they can read minds, control people, and have prophetic dreams. When they confront the semi-divine witch hunters from the Order of the Innocents who come to convert witches later on in the season, they call themselves the ‘three in one’. What on earth does that mean?! Perhaps they share a common consciousness, like a hive mind (which would explain why they’re able to say the same things simultaneously). But how did they get that way? As they’re not related by blood (all three are orphans), I get the sense that there is some devilry at work here. Each one of them might have demon-y origins that remain unknown to them, but one thing is for sure: They deserve their own episode or spin-off show so we can get to the bottom of what makes them so powerful. 3. Will Lilith not be played by Michelle Gomez anymore? Michelle Gomez is a force of nature in season two, but in the Chilling Adventures of Sabrina season 2 ending she’s seen returning to Hell as Lilith before coming back as Mary Wardwell, Sabrina’s favourite teacher (who was possessed by Lilith right at the beginning of season one). Does that mean that Lilith will be played by a different actress now? Mind you, as Lilith is a very powerful witch I don’t think it would be beyond her talents to change her body into an approximation of Wardwell if she wanted. She screamed her familiar Stolas into ash, for Satan’s sake. 4. Why can Theo still see the ghost of his aunt Dorothea? Another question that remains unanswered from season one is Theo’s ability to see his great aunt Dorothea. My pet theory is that Theo is a reincarnation of Dorothea, as she dressed in men’s clothes, helped witches (much like Theo helps Sabrina), and generally seems to have a very similar disposition to Theo. A little clarity would really help us figure out Theo’s sixth sense and whether he’s a medium. I’m honestly surprised Theo himself hasn’t been trying to work out why he can see Dorothea either. 5. If the Academy of Unseen Arts was attacked by angels, does that mean more are coming? Witches and Warlocks sound like they’re doing their best to remain secret, but they couldn’t avoid the Order of the Innocents infiltrating the Academy of Unseen Arts. There must be more where these semi-divine kids came from, surely? Lucifer himself is an angel (if a fallen one), and you’d think that the big guy upstairs would be doing his damnedest to try and wipe every witch from the planet as they’re the servants of the Dark Lord. The Order of the Innocents kind of came from nowhere in season two, but including the angelic equivalent of witches feels like something that can’t be ignored in seasons three and four. 6. What happens now Hilda has killed the head of the witches’ council? Hilda finally showed her dark side this season when she poisoned the witch Shirley for trying to kill Zelda, and then quickly followed this up by killing the head of the Witches’ Council. So now Father Blackwood is on the run, there’s no interim Antipope, and there’s no head of the council that rules witches and warlocks… could Zelda be about to step into both roles? 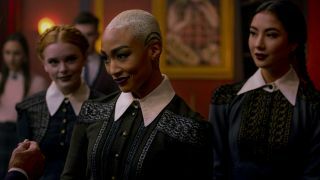 She’s certainly not afraid of power, and having a Spellman as the head of both the Academy and the Council has almost definitely only been a fantasy of hers before now. Hilda could run a more compassionate Academy while Zelda’s in charge of witches and warlocks everywhere. I can see it happening. 7. Why did Blackwood suddenly go off the rails? Father Faustus Blackwood became suddenly unhinged towards the end of season two, which all felt a bit bizarre. Mind you, he might have become erratic because he was so close to having the Academy and the Coven completely in his thrall before Lucifer told him he’d have to bow to Sabrina, which might have made him finally snap. Either way, poisoning the coven and erecting a statue of himself are both the acts of a madman. Let’s pray that Prudence and Ambrose find Judas and Judith sharpish, especially as Blackwood was prepared to marry off Judith at 16. Ew. 8. Are Prudence and Ambrose now technically witch hunters? The Chilling Adventures of Sabrina season 2 ending saw the pair suiting up and wielding some rather impressive weaponry, set on saving Judas and Judith from their father and executing Blackwood in the process. But, knowing witch law, that might have put them in a very dangerous position indeed, as now they’re practically witch hunters. Well, technically warlock hunters. There’s a huge dose of irony in having witches and warlocks hunting their own kind, considering their own loathing for witch hunters. Agatha and Dorcas were trying to kill Harvey and Tommy in the first season just for being descendents of witch hunters, after all. The third season might see them punished by the Council (although it doesn’t have a leader at the moment) or the Trivium for their pursuit of Blackwood, and I would hate to see Prudence or Ambrose on the chopping block (again). 9. Why are they trying to rescue Nick from hell and not just talk it out with Lilith first?! Now that Lilith is the sole ruler of Hell, and has an okay-ish relationship with Sabrina, I really, really hope that The Fright Club (Sabrina’s new group made up of herself, Salem, Theo, Ros, and Harvey) try to get Nick back from Lilith by chatting with her first. She might be amenable to binding Satan in someone else’s body, maybe even selecting a rotten human who deserves such a fate. But just infiltrating Hell without giving Lilith a heads-up first seems like an apocalyptic mistake, as does trying to get Nick back without considering what they’re going to do with Satan. Please exercise caution, Sabrina. 10. Did Sabrina’s parents really die in a plane crash? This question has been bugging me since season 1, as Sabrina’s parents’ death just seems too tragic and well-timed to be true. Having Sabrina’s father Edward die in a plane crash just as he was about to deliver his new, mortal-tolerant tenets to the Antipope in the Vatican seems suspicious. Perhaps Father Blackwood really did have a hand in his death, or even Ambrose (he was arrested for plotting to blow up the Vatican, remember). Either way, the death of Sabrina’s parents is still something that needs to be cleared up once and for all, if only to give Sabrina (and me) some much needed closure. 11. Did Luke kill Connor Kemper? In the first season, Connor Kemper, a coven-less Warlock, turned up murdered in the Spellman mortuary. His boyfriend Luke was acting mighty suspicious back then, with Connor’s familiar even dying suspiciously on the night Luke spent with Ambrose. Although Luke was killed off in season 2 by the Order of the Innocents, there’s still an air of mystery around Connor’s death – people don’t get stabbed to death by accident. Luke seemed strangely calm at the funeral, didn't he? While we may never know what really happened to Connor, I suspect that Father Blackwood might have ordered Luke to kill him for his own nefarious reasons. I wouldn’t put it past him. 12. Does Sabrina have her Witch 2.0 powers back, or is she an ordinary witch? Right at the end of the finale Lilith gave Sabrina her powers back, reverting her into a half-witch. However, after Sabrina was resurrected and developed those insanely powerful Witch 2.0 abilities – ones that didn’t require her to mutter an incantation (with resurrection, levitation, teleportation, and conjuration among them) – it remains to be seen which powers she’s going to be able to use in season 3. I don’t think anyone would be surprised if Lilith withheld those almost godlike abilities in case Sabrina tried to use them to fight her in the future. But that would give Sabrina another reason to go to hell, as if you’re going there to save your boyfriend from being possessed by Satan you might as well get your Witch 2.0 abilities back at the same time, right? Two birds with one stone, and all that. 13. If witches and warlocks have children with mortals, will they have Sabrina’s Witch 2.0 powers too? Edward Spellman seemed to already know that mortals + witches = insanely powerful beings, but as Satan himself intervened in Sabrina’s conception, do her powers come from him, or from her combined witch/mortal blood? If the latter is the case, then the other half-mortal children of witches or warlocks could have Sabrina’s same godlike abilities. With the witching world being largely dismissive of mortals, these kids could be in hiding with their parents, perhaps even ignorant of the fact that they can do so much without one bit of Latin passing their lips. Were they to become known by the magical community, I’m betting there would be a showdown between the two groups. Most witches and warlocks wouldn’t be too fond of mortals having more power than them, so the consequences of more half-mortal children becoming known would probably be severe. 14. Did Edward or Diane Spellman know Sabrina would become Satan’s Herald? Edward and Diane pleaded for the Dark Lord to help them conceive a child, seemingly without the knowledge that involving him would turn Sabrina into the Herald of Hell. Diane seemed to suspect that something was wrong, however, hence the Catholic baptism she gave Sabrina to protect her from the grasp of the witching world – although it’s not yet certain whether she suspected Sabrina would become the agent of the apocalypse. But did Edward know? Considering his immense knowledge of the Dark Lord and the history of the magical world he might have stumbled across the prophecy at some point. Besides, would he seriously think the Dark Lord was just helping him and his wife out of the goodness of his black, rotten heart? I don’t think so. Need something new to binge? Here’s the best shows on Netflix you can watch right now, or look below to see what’s going on this week in the world of gaming, movies, and TV!